The Venerated Qutb, Sidi Muhyiddin Ibn Arabi al-‘Hatimi, known throughout the Islamic world simply as the "Greatest Master" (al-Shaykh al-Akbar) as his master Sidi Abu Madyan al-Ghawt (d. 594/1179) used to call him, is acknowledged to be one of the most important Sufi teachers in the Islamic world. A vastly prolific writer and visionary, he is generally known as the prime exponent of the concept of the Unity of Being (wahdat al-wujud), even though that particular term, by which his teachings came later to be designated, was hardly used in his own milieu. His emphasis, as with any mystic, lay rather on the true potential of the human being and the path to realizing that potential, which reaches its completion in the Complete Man (al-Insan al-Kamil). Shaykh al-Akbar wrote at least 300 works, ranging from minor treatises to the huge thirty-seven-volume Meccan Illuminations (al-Futuhat al-Makkiya) and the quintessence of his teachings, the Bezels of Wisdom (Fusus al-Hikam). Approximately 110 works are known to have survived in verifiable manuscripts, some 18 in Shaykh al-Akbar's own hand. He exerted an unparalleled influence, not only upon his immediate circle of friends and disciples, many of whom were considered spiritual masters in their own right, but also on succeeding generations, affecting the whole course of subsequent spiritual thought and practice in the Arabic-, Turkish-, and Persian-speaking worlds. In recent years his writings have also increasingly become the subject of interest and study in the West, leading to the establishment of an international academic society in his name. Mazar Mubarak Moazzin-e-Rasool, Hazrat Bilal Al Habashy (May Allah be pleased with him) in the Bab al-Saghir Cemetery to the south of the old city in Damascus, Syria. 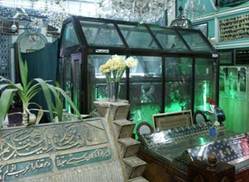 Mazar of great Sufi Shaikh-e-Akbar Hazrat Muhyyuddin Ibn Arabi encased in glass in the lower level of a mosque at the bottom of Mount Qasyun in Damascus. There are Mazarat of other Aulia Allah. Shaykh al-Akbar's thought is characterized by a profound visionary capacity, coupled with a remarkable intellectual insight into human experience and a thorough knowledge of all the traditional sciences. It has been tempting for scholars to characterize him as a mystical philosopher, a formulation that is rather at odds with his own teachings on the limitations of philosophical thinking. He was as much at home with Quranic and hadith scholarship as with medieval philology and letter symbolism, philosophy, alchemy, and cosmology. He could write with equal facility in prose or poetry, and utilized the polysemous ambiguity of the Arabic language to great effect—the characteristic resonances of rhymed prose (saj’), which are to be found in the Quran, abound in his works. The complexity of his writings makes him one of the most demanding of authors, and difficult to comprehend, leading some Islamic scholars to oppose and even reject his positions. Among his admirers, his writing was always considered to be the most elevated exposition of mystical thought in Islam, and therefore unsuitable for the untrained mind. He combines a detailed architecture of spiritual experience, theory, and practice, with descriptions of the attainments of other masters he met and of his own personal visions, insights, and dreams. It is his propensity to recount stories from his own direct experience, primarily in order to make a teaching point, that allows readers to gain such a detailed insight into his inner world, and also allows us to reconstruct his life and times with some accuracy. Born on July 28, 1165, in Murcia, Muslim Spain, Abu Abdellah Sidi Mohammed b. Ali b. Mohammed Ibn Arabi al-‘Hatimi al-Ta’i al-Andalusi al-Maghribi, as he signs himself (often shortened to simply Ibn Arabi), was brought up from the age of seven in Seville, the provincial capital of the Moroccan Almohad Empire during the heyday of Andalusian Muslim culture. His father served as a professional soldier in the sultan's entourage, and for a time the son seemed destined to follow in his footsteps. Contrary to the romantic picture painted by later writers, the family was well-off, but neither noble nor very religious. He seems to have been blessed with an extraordinary visionary capacity from a very young age, and the seminal experience of his youth took place when he was about fifteen or sixteen years old. Without having had any formal training and apparently under the impulsion of an irresistible inner demand, he undertook a retreat alone just outside Seville, probably in the ruins of the old Roman city of Italica, where he had a remarkable dream-vision of the Prophets, Sidna Isa (Jesus, peace be upon him), Sidna Musa (Moses, peace be upon him), and the Chieftain of the Universe: Sidna Mohammed ibn Abdellah (peace and blessing be upon them). According to his own testimony, each of them is said to have given him a piece of advice: Jesus, whom he referred to as his first teacher, exhorted him to follow the spiritual life, and instructed him to practice renunciation and detachment; Moses, whom Shaykh al-Akbar regarded as epitomizing the reception of divine inspiration, promised that he would be given knowledge by God directly, without any intermediary; and, finally, Sidna Mohammad, who rescued him from a host of assailants, told him: "Hold fast to me and you will be safe". As a consequence of this instruction, Shaykh al-Akbar says, he began his study of the Tradition of the Prophet (al-‘hadith al-sharif). This triple vision also had one other direct result: the great philosopher, Ibn Rushd (Averroes), who was nearing the end of his life in Cordoba, asked to meet him, and their celebrated meeting included a most extraordinary exchange, touching on the very nature of the spiritual quest: in response to Ibn Rushd's question about whether mystical illumination produces the same results as rational inquiry, Shaykh al-Akbar replied: "Yes and no, and between the yes and the no spirits take wing from their matter, and necks are separated from their bodies", leaving the philosopher dumbfounded. This response not only indicates Shaykh al-Akbar's understanding of the gulf between the philosophical and the mystical, between intellectual reflection and spiritual retreat, but also his appreciation of how mystical thought can include and accommodate apparently contradictory notions. Ibrahim Bin Adham was popularly known as Abu Ben Adhem. 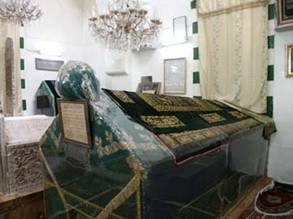 His full name was Sultan Ibrahim bin Adham, Bin Mansur al-Balkhi al- Ijli, Abu Ishaq. His Life He was born in Balkh on the east of Khurasan. His family was from the Kufa and were descendants of the second Caliph Omar bin Khattab. He was the king of Balkh but abandoned the throne to become a Sufi saint. According to the Arabic and Persian sources like al- Bukhari ( d. 870) and many others, Ibrahim Bin Adham received a warning from God and abdicated his throne to take up the ascetic life in Syria. He died in 777-8 and is believed to be buried in Syrian town of Jabala. His Legend His legend enlarged gradually from al-Bukhari to Abu Nu'aym al-Isfahani and after its full formation around the eleventh century, expanded to central Asia under the Mongols, Anatolia under the Ottoman rule, North India in the age of the Tughluqids, and Malaysia during the seventeenth century as revealed in the works by R. Jones. His Clans Although his children continue to rule Central Asia, the kingdom came to an end after Farrukh Shah Kabuli's son was killed fighting Mongols and the uprooted family moved East to Punjab (now part of Pakistan and then to India and up to Bangladesh. Baba Farid Ganj Shakar the famous Punjabi poet and Sufi Saint was one of his descendants. Adhamies of South Asia call themselves Farooqi. His Masters and Students His master was Fudhail Bin Iyadh whose master was Abdul Waahid Bin Zaid whose master was Hasan al-Basri. His successor was Huzaifah Al-Mar’ashi. Abu Ishaq Shami . 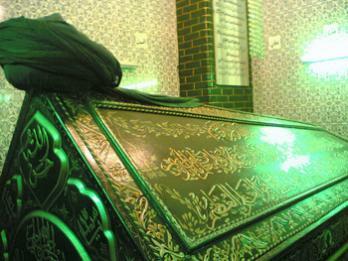 A Sufi Sheikh Abu Ishaq Shami is one of the first among the sufi order, namely Chishti Order to call himself Chisti. This indicates that he belongs to the Chishti Order.The name Shami implies he came from Syria or even from Damascus (ash-Sham). Abu Ishaq Shami is supposedly to have met a Sufi who directed him to settle in Chisht,and acccordingly he is known as Abu Ishaq Shami Chishti. He died in 940 C.E. 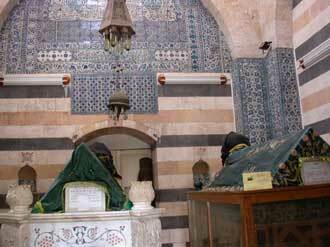 in Damascus and lies buried on Mount Qasiyun, where later on also Ibn al-Arabi was buried. Looking at the date of his death it is considered that the Chishti Order is one of the oldest, if not the oldest now still existing sufi order. However according to most of the Sufi orders it is considered that their orginations are directly from the time period of the Prophet Mohammad and the Prophet him self. His Masters and Students Shaikh Ilw Mumshad Dinwari was his Master. He may had many Khalifa's but Abu Ahmad Abdal carries the Chisti Chain to South Asia. Sayyid Muhammad Amin ibn Sayyid Úmar ibn Sayyid Ábd al-Áziz ibn Sayyid Ahmed ibn Sayyid Ábd ar-Rahim ibn Sayyid Najmuddin ibn Sayyid Muhammad Salahuddin widely known as ‘Ibn Áabidin’ is praised in these words: the prominent, praiseworthy and noble scholar; an ocean of knowledge; the master scholar [jahbadh]; the great jurist [faqih]; the genius; the finest among the later scholars and the last of the research scholars; one with an exalted ancestry [hasib,nasib]; the erudite Imam; the litterateur. he Syrian city of Aleppo is famous for its rich history of Islamic scholarship; hence, it is often referred to as ‘the city of scholars’. Aleppo is the cradle of many pious and leading scholars of Islam. Amongst them was the Friend and Gnostic of Allah `azza wa-jall, `Allama `Abdallah Sirajuddin al-Husayni radiallahu `anhu, an extraordinary scholar who dedicated his entire life to the service of Islam.